Aerobase Zone is the sixth Zone of Sonic Pocket Adventure. 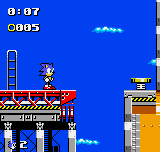 The level theme and graphics are obviously based off of those from Sonic 2's Wing Fortress Zone, as the level takes place on a skybound warship. All of the Badniks here are from Wing Fortress Zone as well, and it is a single-Act level. However, this act is twice the size of normal levels, and features its own gimmicks. The warship's flaming booster engines are now capable of hurting Sonic, so the player must take care when traveling along the ship's underside. Mecha Sonic serves as the boss. The music is from the first Act of Death Egg Zone in Sonic & Knuckles.